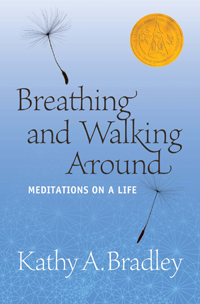 Breathing and Walking Around is not a memoir. It is a record of four years’ worth of observations of common people, everyday events, and the natural world made by Kathy Bradley from her home in the coastal plains of South Georgia. A lawyer by training, a storyteller by nature, she shares with precision and layer upon layer of sensory image simple tales that emerge, in the end, as parables. Beginning at Sandhill, the house she built on her family farm, Bradley takes the reader with her as she walks miles of dirt roads with the dogs Lily and Tamar, alert to the details of rural living—the movement of the seasons, the nearness and unpredictability of wildlife, the sights and sounds otherwise drowned out by twenty-first-century living. The meandering continues down the Atlantic beaches, the shorelines of inland lakes, backroads and interstates, and we are at her shoulder as she, like a paleontologist, uncovers joy in the magic and mystery of the familiar and the brand new. But Breathing and Walking Around is a true story and, so, along with the joy there are moments of questioning and uncertainty, moments when doubt challenges faith. It is in these moments, when Bradley struggles to bring order to her own life, that she most clearly articulates the universal truths that weave through all our stories, ribbons of continuity and hope.